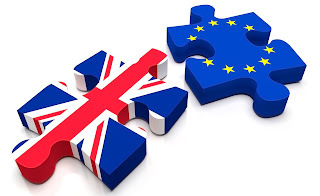 The historical outcome of BREXIT referendum yesterday (24th June 2016) shocked the world and created bloodbath across the global stock market as well as political unrest (start with the resignation of the UK PM, David Cameron, to be effected in Oct 2016). Personally, I am not that into politic and trying to refrain myself from writing post with political theme, but this historical event just creep me up too much and hence this post. 3. Oil price plunged 6.8% to US$46.70 a barrel. 1. One of the pro-BREXIT's biggest propaganda (350 million pounds pledge to fund the NHS) is a "mistake", as per Nigel Farager himself in a National TV. Are those voted for him regretting now? A little bit, maybe? Check out the article and TV interview here. So what's next for non-Briton like us? The BREXIT will officially kick-in only in 2018 and its impact to the Britons as well as the world in general will be forever! I totally agree with you. Every single vote counts, more is going to come I guess even stock markets are going to show get affected with Brexit.